For seventeen years Rapunzel has lived her life from inside of a tower. Only seeing the world through her window and the books she has to read. Nearing her eighteenth birthday Rapunzel desperately wants to venture out of her tower and into the world she has been told is extremely dangerous. When by chance a bandit named Flynn Rider ends up within her tower, Rapunzel bargains with Flynn to take her to the floating lights she has seen every year on the eve of her birthday. 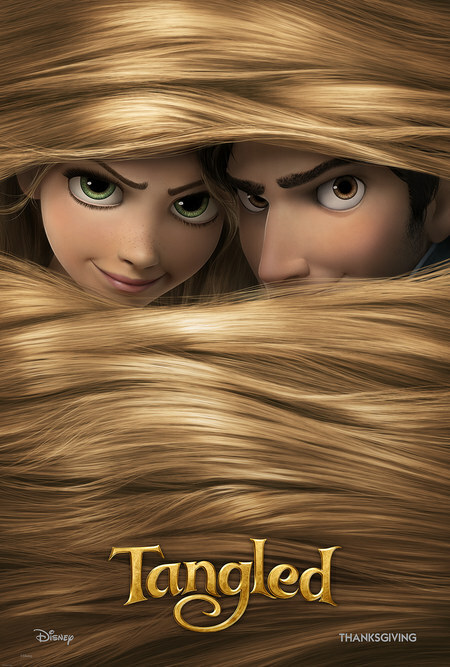 "Tangled" feels like a 20th century Disney film with all of technological advances of the 21st century. The animated tale feels absolutely classic yet entirely modern. Disney was able to bring back all the nostalgia that made them the giant they are today by re-introducing a classic princess fairytale with a new twist. Ultimately Disney was able to bring an aged fairytale to 21st century that I had zero interest in prior to seeing. As a kid, I read nearly all of the Grimm fairytales but never had any interest in Rapunzel. Honestly I hated this fairytale. Disney and directors Nathan Greno and Byron Howard changed all that. Screenwriter Dan Fogelman made the story fresh, youthful, charming and most of all completely entertaining. Disney deserves a ton of credit for recognizing how to make a family film that appeals to everyone. Its no secret that the animation studio had basically finished the film and decided to scrap it and start over. The studio decided that the film needed something more to appeal to everyone and not just girls. Disney has a rare ability to make cartoons revolving around princesses entertaining for male viewers despite their preconceptions. As a father of three boys and one daughter I watched as all four of them became completely engrossed in Disney's latest princess tale. "Tangled" is so immersive for both male and female audiences because it is filled dazzling visuals, catchy music and unexpectedly lovable characters. Just like Ariel, Snow White, Belle and Cinderella, Rapunzel is another fantastic female character from Disney. She is youthful, bright-eyed and comical. She is an enchantress that within the first 20 minutes of the film had me head over heels. It doesn't stop with Rapunzel though, nearly every character throughout the 100 minute animated adventure is appealing and provide continuous comic relief. Two characters in particular, who actually have non-speaking roles, are instantly new favorite Disney icons. The two characters being Rapunzel's chameleon named Pascal and Maximus, a palace guard's horse who happens to lose his rider and befriends Rapunzel. The animation throughout "Tangled" is stunning. The color palate is bright and vibrant and comes to life brilliantly on screen. The Disney digital 3D is also strong. The 3D is never really used to use sight gags, but instead is utilized as visual stimuli to enhance and give true depth to the fantasy world. I did find the size of Rapunzel's eyes a bit off putting initially, but I quickly forgot about any mis-proportions once the film was moving along. The pacing and music are perfectly matched throughout the tale. I found almost all of the songs to be catchy and staying with me after the fact. Thankfully, the music is never too overbearing either. The audience is not bombarded by songs, but just enough to break up the adventure while it unfolds. One musical number that stands out is "I've Got a Dream" which features Rapunzel and a bar filled with thugs. The song reminded me back to the Beauty and Beast track "Belle." Each of the thugs are hilarious and well voiced by actors Jeffrey Tambor, Brad Garrett, Paul F. Tompkins and best of all Richard 'Jaws' Kiel. There is also a song titled "Waiting for the Lights" that hearkens back to The Little Mermaid's "Kiss the Girl." Mandy Moore who voices and sings the Rapunzel character ended up a little too noticeable. I find it distracting when I hear a voice actor and recognize the voice but can't place the actor. Outside of my distraction, Moore does a polished job as Rapunzel. Her voice comes across very young and full of life. Matched with the vibrant animation Rapunzel is adorable. Moore's singing talents also come in real handy for all of the exceptional music written by Alan Menken. Disney deserves credit for taking their time and getting this one right. The studio scrapped a near completed film to go back to the drawing board adding components that appeal to all audiences and not just little girls. They made the right decision. All of the elements that come across as more male friendly fit into the classic Grimm fairytale nicely. Whether it is the thugs that befriend Rapunzel, some of the darker elements with the Stabbington brothers or just the complete shake up of the original tale I can't put my finger on, but it all comes together wonderfully. It is also refreshing that the male lead is not a prince but a bandit. Flynn Ryder who stumbles across Rapunzel's tower and finds himself on an adventure he never expected plays perfectly off the feminine energy.